This sleek looking animal looks like it could be a tiny cougar. The ruddy version of the animal has a dazzling coat. If you're looking for a truly regal-looking animal, then you may want to consider this wonderful breed which is also a member of the aristocrats. One of the oldest breeds of house cats it is thought to be a direct descendant of the sacred cat of Egypt, based on Egyptian paintings and sculptures. 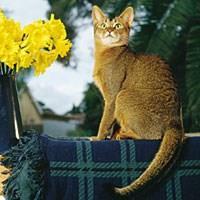 The modern-day Abyssinian has been meticulously bred for colour, pattern and type. Its svelte, long body is fitted with large eyes and a sturdy coat. One of this cat's most stunning features is its eyes - the almond-shaped eyes mesmerise all those who look into them. They are also panther-like when it comes to playing and joining in activities. Stately in looks they have also been given the grace of a dancer. Extremely loving and gentle by nature, as long as they are cared for properly they will make superb pets. They are not too talkative, but they do like to climb so just be wary of their needs in that area. They do not like to be caged so avoid this as well.